In 1907, thousands of women asked the state government to name the mountain laurel as the state flower of Connecticut. 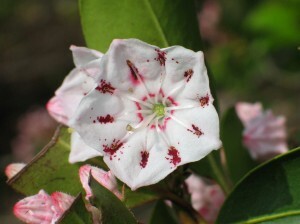 There was initial resistance, but after an impressive campaign by the women, the Connecticut government named the mountain laurel the state flower. The bright colors and rich scent of the mountain laurel are distinct and make the plant quite possibly one of the most attractive flowering shrubs in America. by photographer Sylvia W. Forward. Courtesy credits to her. In the months of May and June, the dark foliage of the roadsides in Connecticut burst forth with color. The gentle, but prolific blooms of the mountain laurel turn almost every field, pasture and hill shades of pink, red and white. The mountain laurel is not designated just to Connecticut, however. There are mountain laurel shrubs growing both domestically and in the wild from Northern Florida to Maine. The entire East coast of the United States dons the bright colors and lovely scents of mountain laurel as the spring warms to summer. In fact, Pennsylvania has also adopted the mountain laurel as its state flower. In full bloom for only two months of the year, the state flower is still the most striking image of the spring throughout Connecticut. Visitors to the area often time their visits in order to experience the full splendor of the tiny blossoms and the turning of the spring season with resurgence of greenery and sweet smells of nature. The mountain laurel shrub grows from five to eight feet and is seen most often in the wilderness, but is increasingly popular in yards as well. The flowers of the mountain laurel are tiny cups that grow prolifically over the branches of the tall shrub. The sweet scent of these blossoms draws you in, but all parts of the plant are poisonous to humans, so take care in handling the shrub. While many individuals try to transplant the mountain laurel from the wild, you’ll have better results buying a new plant from the nursery as the root damage won’t be as extensive. Plant the mountain laurel in well drained, but moist soil. The mountain laurel can tolerate deep shade, but prefers a bit of light throughout the day, making mulched light shade the ideal location for growing mountain laurel. This entry was posted on Tuesday, February 9th, 2010 at 4:11 pm	and is filed under American Flowers. You can follow any responses to this entry through the RSS 2.0 feed. I would love to get some mountain laurel seeds. Where can I order them from?